It was just a coincidence, but this year's Women's History Month was going to finish with a bang. Friday, the 29th of March, was to be the first time in history that a team of all-female astronauts would conduct a spacewalk at the International Space Station (ISS). American astronauts Christina Koch and Anne McClain were going to make their way out of the ISS in their space suits and perform vital repairs to the space station's solar panels. People around the world were ready to witness history. Unfortunately, NASA wasn't ready to make it. The space agency announced that the much-hyped event would not take place because there there weren't enough medium frame space suits to go around. Both Koch and McClain require a medium-size torso component, and while two mediums are available, only one is "spacewalk ready" — the other suit won't be properly configured for a spacewalk before Friday. The spacewalk will go on but Ms. McCain will be switched out for her male colleague, astronaut Nick Hague. Well-fitted components are crucial for a successful mission and, clearly, safety must be the first priority when it comes to something as dangerous as space. However, it is disappointing that this incredible moment has been canceled all because NASA and the ISS didn't have enough space suits that could fit their female astronauts. Canceling a spacewalk because there weren't enough suits to fit male astronauts is almost unheard of, probably because there are ample suits ready to go that fit the men of the ISS. Women astronauts deserve to have the same courtesy. The face of NASA is changing. Women currently make up more than 30% of the agency's active astronauts. And in 2013, when both Ms. McClain and Ms. Koch joined their ranks, half of the 8 people chosen out of 6,000 applicants were women. 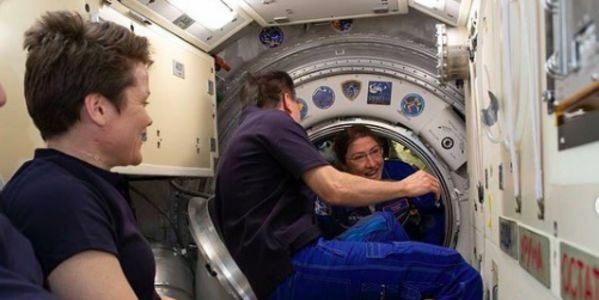 Soon, women will make 50% of active astronauts, if not more. So it's time for NASA and the ISS to step up and make sure they are prepared to accommodate them. Please sign the petition and ask the National Aeronautics and Space Administration and the International Space Station to provide more suits available for their female athletes and promise to reschedule an all-woman spacewalk for the near future.